Paul Ryan used his first solo campaign swing as Mitt Romney’s running mate Monday to hammer President Obama as a jobs killer, forcefully echoing Romney’s message, while Obama used a pair of nearby campaign stops to accuse Ryan of hurting drought-stricken farmers. Ryan was dispatched to Iowa by team Romney to challenge the president as Obama kicked off a three-day bus tour across the Hawkeye State. 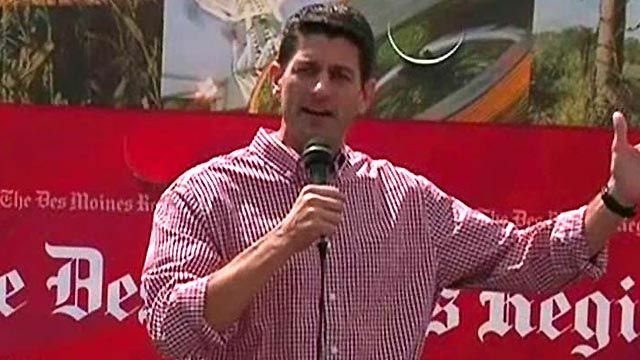 Ryan, a Wisconsin congressman, was occasionally interrupted by hecklers during a speech at the Iowa State Fair but stuck to a meat-and-potatoes message of jobs and the deficit. “As you see the president come through on his bus tour, you might ask him the same question that I’m getting asked from people all around America, and that is, ‘Where are the jobs Mr. President? '” Ryan said in Des Moines.